Last year’s CSI: Deadly Intent was a bit of an ugly duckling, and something many of us would easily scoff at if we saw it in a store. Yet even though it was just a CSI version of Ace Attorney with a crime lab -- without a courtroom or anything in-game to object to -- there was something special about finding the killer’s DNA on a pair of undies. Not to mention some of the ridiculous cases you had to solve. For this year’s CSI: Fatal Conspiracy, already their fourth CSI game, Telltale Games changed a few things and not necessarily for the better. But is this game really a crime against gaming? As an unnamed member of the Las Vegas Crime Lab, you work your way through solving five cases lasting about one to two hours each. Every case starts with the scene of the crime: an interactive environment that you can click your way through, similar to what you do in games like Ace Attorney or Myst. After talking to the person who found the body, you methodically scan the entire location with a (slow-moving) cursor to look for clues. Whenever you find something in the scenery you can interact with, you can either pick something up as evidence or use one of your CSI tools. Special sprays illuminate blood splatter, swabs grab precious DNA, adhesive sticks pick up chemical traces, special dust collects fingerprints, and you can even take a photograph of something at times. It’s all pretty exciting in a middle-aged suburban manner. After you collect all of the evidence you need to progress in the game, you can have the body shipped to Doc Robbins for an autopsy. While you wait for his autopsy report to provide you with new clues, you can start analyzing the materials you collected with the special crime lab equipment, or talk to the victim’s relative(s) or lover(s). 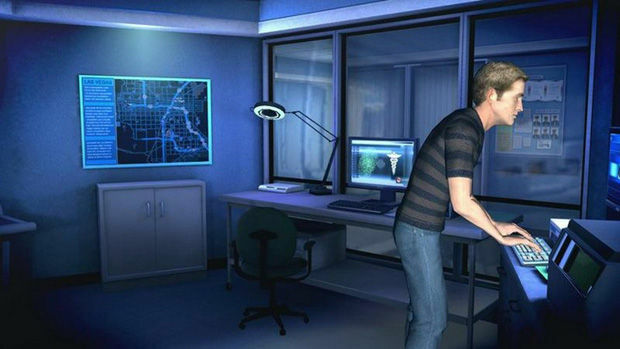 The crime lab is another interactive environment with two rooms and a couple of machines, and the majority of the gameplay takes place there in the form of mini-games. To analyze DNA, you have to find and match strings of differently colored shapes like a jigsaw puzzle. For chemical traces, you get a spectrometer output with stripes on a strip that you have to rebuild using pieces of separate stripes on a strip. Fingerprinting is done by selecting five random “identifying” marks and running it through a database. Most of the mini-games revolve around simply finding and matching patterns and for most pieces of evidence it’s pretty obvious how you have to analyze them. Once you have enough clues to create a lead, you can get a search warrant for people whose testimony contradicts the evidence. And this game's evidence *puts on sunglasses* never lies (yeah...). Usually you find another clue through the process of trying to ransack apartments with your cursor, or you find evidence that directly implicates a person. Perhaps unintentionally, moving your cursor all over the place to find all the evidence -- especially beds and closets -- can make you feel like you are some kind of obsessive-compulsive and voyeuristic house cleaner, with an innate drive to just cursor-rub every single object until you are sure there's no dirt to be found. 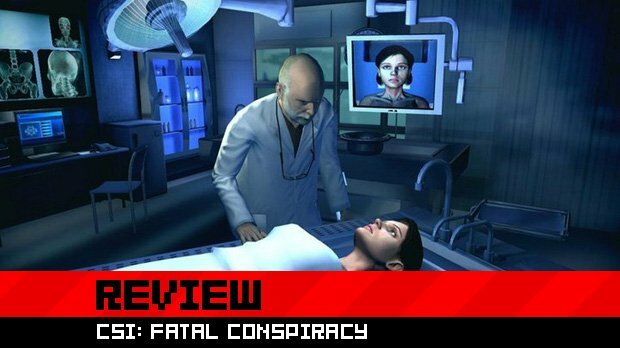 As a follow-up to CSI: Deadly Intent, CSI: Fatal Conspiracy is basically the same game at heart with a couple of minor differences. The annoying document analysis from the last game now only pops up once or twice. Matching pieces of evidences under a microscope is now also a bit easier to do, although the tutorial video shows you moving evidence around when there's no way to do that. Sadly, the majority of analysis mini-games you’ll play are the DNA, fingerprint and chemical analysis ones, which get pretty old after playing the same thing last year. Which is strange, as the crime lab has five other analysis tools with no mini-games whatsoever. The whole game feels less varied than before as a result of the slight gameplay tweaks; you are subjected to the same mini-games over and over again in any one case. Contrary to the previous title’s standalone cases, there’s now a storyline that connects the five cases involving a drug cartel lady and bees. Bees! As awesomely Nic Cage-ian as that may sound, the story sadly never engages or raises tension whatsoever. The cartel lady acts like a grumpy old man in a Scooby-Doo episode who ends up complaining loudly about the meddling kids that brought her to justice. The stories in the individual cases -- with writers like Rhianna Pratchett involved -- are largely uninspired and don’t make up for the mostly repetitive mechanics. Which is a shame, as Deadly Intent made me laugh at most of the ridiculous cases. But then again, only two types of people will ever think about buying this game: CSI fans and Achievement or Trophy whores. For CSI fans, there are the familiar faces -- which look horrible in Catherine Willows’ case -- and the show’s structure translates alright to the game. If you only play this game for those digital points or medals, then you should be happy to know this is an “Easy 1000." Some of the Achievements require you to make no mistakes in a case, which actually makes the game a little more exciting at times. Then again, it can also result in a lot of saving and reloading if you are afraid to make a mistake with one of the mini-games. Overall, CSI: Fatal Conspiracy plays and feels like the pinnacle of mediocrity. Still, I never felt like I was playing a truly awful game, and you’d be hard pressed to put it down once you start a case. You can see some minor design improvements over the previous game if you care to look for them, but it also feels like Telltale Games knew that nobody who would buy this game would care one bit about any of that. For someone who actually enjoyed playing CSI: Deadly Intent, the minor gameplay improvements here only led to an inadvertent feeling of repetitiveness, minus the joy of those amusing cases from the last game. It’s by no means a game you should rush out to buy, but neither is it a game you should be ashamed to have on your list of 100% completions; it’s still a million times more fun than Terminator: Salvation. 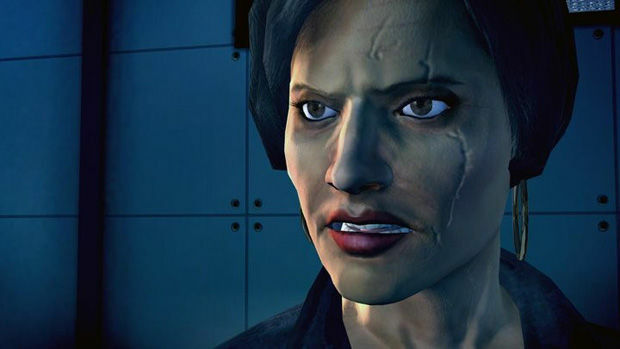 But just because it could be worse, or no more than you can expect for the budget Telltale probably had to work with, that doesn’t mean it’s anywhere near what a great CSI game could be. The epitome of "meh."